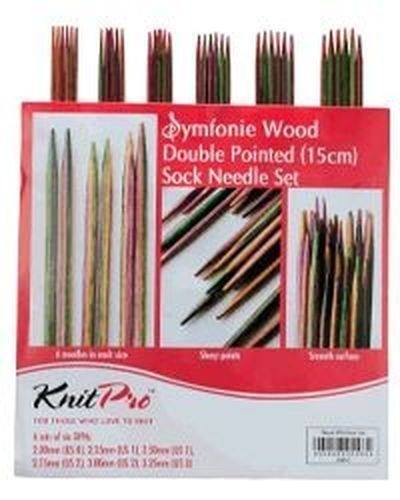 KNITPRO SYMFONIE WOOD SOCK NEEDLE SET <br> Sizes 2.00mm, 2.25mm, 2.50mm, 2.75mm, 3.00mm & 3.25mm<br> <br> Made by KNITPRO these needles have all the smooth, luxurious, and beauty we have grown to expect. <br> <br> This collection of 15cm multi-coloured wood needles is the perfect gift for the avid sock knitter. <br> <br> The most common sock knitting sizes are packaged in a portable, flexible, 15cm by 16cm vinyl case with snap shut closure. Made by KNITPRO these needles have all the smooth, luxurious, and beauty we have grown to expect. This collection of 15cm multi-coloured wood needles is the perfect gift for the avid sock knitter. The most common sock knitting sizes are packaged in a portable, flexible, 15cm by 16cm vinyl case with snap shut closure.